After a double U21 and senior clash with Meath last week, it is now the turn of another old foe, Laois, to come to town. First our seniors welcome the O’Moore men to Cusack Park for a make or break Division 2 game on Sunday at 2.30pm. Then on St Patrick’s Day it’s the turn of the U21s from both counties to contest the Leinster semi-final. What a treat of football on our doorstep at this early stage of the year. Last Saturday’s football action came tantalisingly close to resembling a scene from a Carlsberg add. All our dreams nearly did come true. Let’s face it- to beat Meath anytime is great. To do so twice in a day - well...in the end, that did prove too good to be true, but just about. First our U21s recovered from a poor start to record an impressive win over a highly rated Royal outfit. Later that evening our seniors travelled into the lion’s den and against all expectation almost recorded a rare and valuable win over the home side. With the sides level a late free was missed by the visitors. 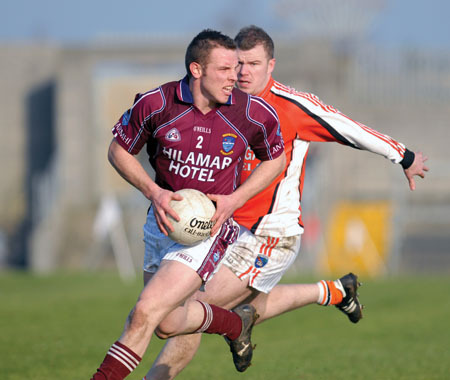 David Bray then broke Westmeath hearts as he grabbed the winner deep into injury time. A cruel twist of fate for Brendan Hackett’s men. Indeed, if we are looking to apportion blame for our failure to take something from this game we can look no further than the new experimental rules relating to time-keeping. It is safe to say that, had the new rules not been in existence, the referee would surely have blown the long whistle from the kick-out with the sides level two minutes into injury time. At present however, the game, similar to rugby, can only end when the ball is out of play. While it may have cost us on this occasion, in general I welcome this new rule and hope it is here to stay. One thing for sure is that the number of drawn games in this year’s national football league is well below average due to the new time-keeping rule. Westmeath showed admirable resolve and fighting spirit to claw their way back into contention, having trailed by six points at the break. Paul Bannon impressed, finishing the game with 1-3 to his name, the goal coming from the penalty spot. Michael Ennis, not for the first time in his career led from the front and kicked an impressive 1-2 from play in the second half. Frank Boyle and David Duffy were both forced off through injury which is a worry ahead of this weekend’s game. Both sides desperately need to collect the points on offer this Sunday if they want to avoid relegation. Westmeath (along with Tyrone, Roscommon, and Kilkenny ) are pointless after three rounds. Laois had an opening round win over Tipperary but have since lost to Donegal and Armagh. Like Westmeath, Laois have had their own early season problems, but put in a much improved showing against Armagh last weekend. They will travel with increased confidence to Mullingar. Brendan Hackett has said that he feels the Meath game marks a turning point. On Sunday we will find out. Home advantage and hopefully a large home support is an added bonus for the Lakelanders. On the downside however it is expected that they will have to plan without their U21 contingent, though Meath face the same predicament. Duffy and Boyle are serious doubts also, which would further weaken our options. My main concern is whether we have enough firepower up front. Scores win matches and while 2-8 was an impressive haul last Sunday, we will need to at least match that if we are to collect two points on Sunday. If Bannon, Ennis and co bring their shooting boots again this Sunday, then part one of our Laois double might just have a happy ending. Westmeath will again enjoy home advantage as they take on Laois for the right to contest the Leinster U21 final. A hugely impressive performance, particularly in the second half, gave them a 6 point winning margin against Meath. They now have to do it all over again if they are to account for the minor provincial champions of 2007. With quality players from no 1 to 15 and a strong bench, this Westmeath side will take beating. Quinn, McGuire, Martin, Heslin, Coroon, Egan, and McCormack form a strong spine around which this team is built. The likes of Moran, Egan, Doyle, and Dolan will keep tabs on any forward-line. Team captain Denis Coroon and his sidekick John Heslin will more than hold their own against any opposition at this level. Heslin gave a master-class in both kicking and fielding in the second half against Meath. What a talent. Up front the likes of Coffey, Durkan, Lynam, Sharry, and McDaniels all know where the posts are and each are potential match winners. If their heads and their hunger are right, they could go a long way. It happened in 1999 you know. At this stage however, it’s a case of one game at a time. Their stock is rising. Reputations are being forged. Let’s add to it ar La Feile Padraig.